This is for all those people out there on my case for not posting a cute picture of Mr. Milo. Crappy cell phone quality I know. but still cute right? 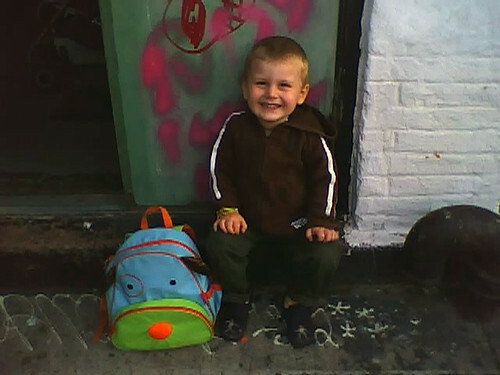 This is where Milo sits and waits to get picked up for school each morning.. on our pigeon poop stoop in front of our heavily tagged door.. gotta love Brooklyn. I’m realizing where some other influences may be coming from in his recent art experiments. 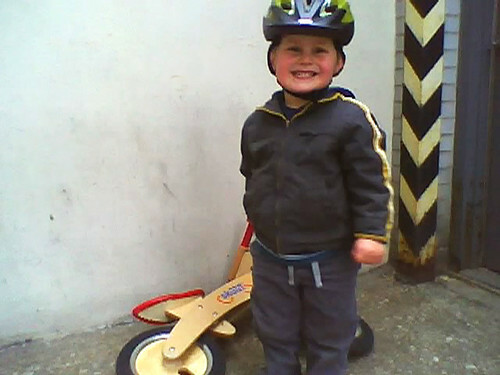 Milo has become obsessed with his skut bike lately. That coupled with his infatuation with Lighting McQueen of “Cars” has resulted in our new pastime – hunting for ramps. Most of the time he comes through unscathed…but this time he crashed. Yet more weight to the claims that I should be hauled in by child protective services as documented here and here. In my defense, it’s also been documented that the kid likes speed, as shown here and here.